Every now and then an unusual technique resurfaces. Now, with social media, these techniques seem to spread far and wide very quickly and, even though there may have been great information provided, the photo is all that seems to be ‘shared’. The macramé knot is a good example. A simple sequence of images of this knot may present it as a logical choice in some situations. 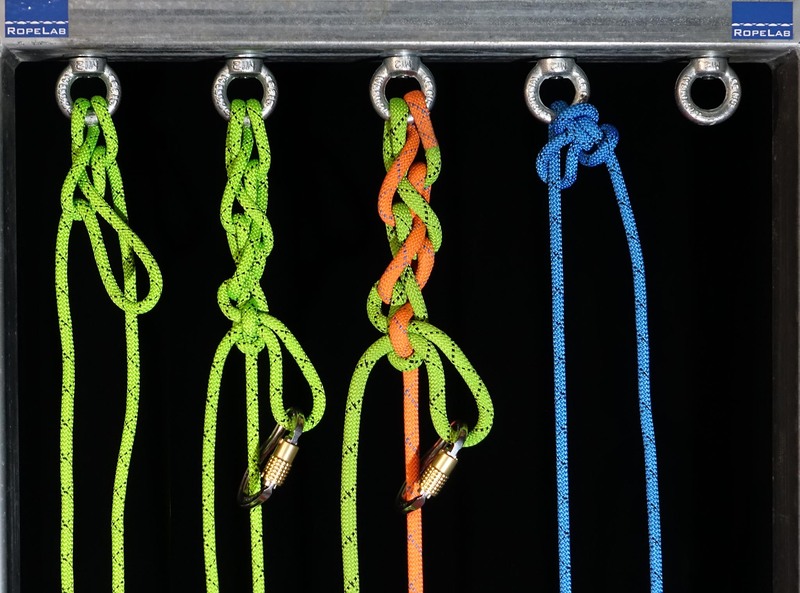 A complete macramé knot with different coloured stands to illustrate the alternating bights. If you anticipate there will be too much friction to pull the whole rope through the anchor. If you don’t want to damage a tree or disturb the surrounding area by pulling the rope through an anchor. The only concern really presented with this technique was that during retrieval, you would have the mid-point bight of rope coming down the face and this would have a reasonable chance of hanging up on any protrusions. I’m not sure where I first came across the macramé knot but I’d heard that it should be set with six interwoven bights. The theory was that even if you managed to pull the wrong rope and ‘pop’ one of the bights you would still be OK. The idea was that you would need to do this deliberately 6 times for the knot to come undone. The following video shows what actually happens if you do manage to ‘pop’ the first bight. I tried this quite a few times with different ropes and different attention to dressing the knot and the result was always the same. I came crashing down onto the bouldering pad. I could not get the anticipated alternating bights to grab, it was all too fast. Knowing what I know now, I can not imagine any situation where I would be happy to use this knot. If such a situation did arise then I would certainly place a carabiner through the last bight and clip this to the main rope for all but the last person down. Would a daisy chain work? can you explain what you mean by a daisy chain? In English, we normally associate that term with a pocketed lanyard used for aid climbing.